Trade sleeping bags for king-size beds, campfires for wood-burning fireplaces and dunks in the river for hot tubs under the stars and you’ve got glamping, or, glamorous camping. And while the word itself may sound new, the luxury component of camping has been around for at least 100 years. “They just didn’t call it glamping back then — they called it going on safari,” said Linda Clark, director of sales at Glamping.com, describing how affluent families would venture to countries like Tanzania and South Africa with large tents and sometimes even a butler service in tow. As for the modern movement? The term “glamping” first reared its head in Google searches around summer 2007, according to Google Trends — likely starting in the United Kingdom before moving its way westward to the United States. Popular glamping amenities include plush-top beds, multi-course meals, private bathrooms, customized outdoor adventures and sometimes a personal butler. If you’ve got Champagne wishes and caviar dreams when it comes to the outdoors, look no further than our list of the best glamping destinations across the country. 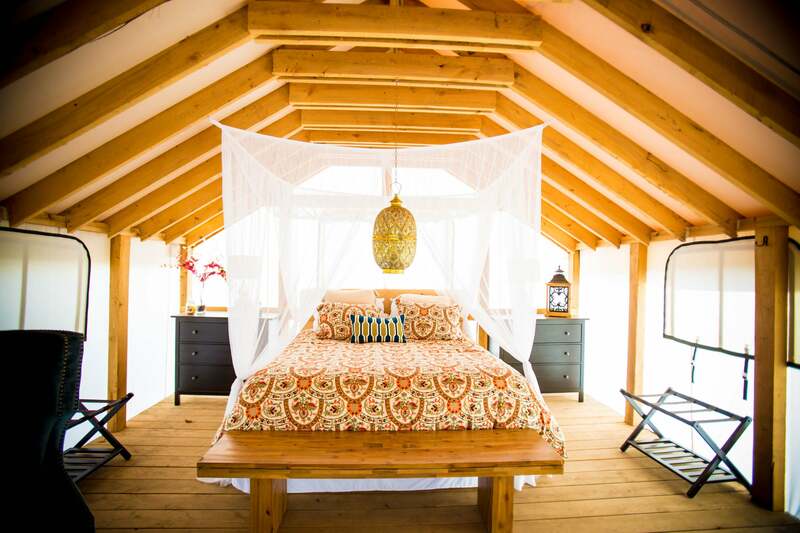 What sets this Montana glamping experience apart? A camping butler who’s on call to take care of your every need — plus a camp chef and dining pavilion, nightly bonfires complete with s’mores and cocktails, in-tent Wi-Fi, daily full-service housekeeping and private en suite master bathrooms with heated floors. Laundry service is also offered, while menu options include the likes of bison New York steak, grilled salmon and baby back ribs with chipotle barbecue sauce. For newlyweds or couples with their sights set on a romantic getaway, honeymoon tents include a claw-foot bathtub for two (pictured at the top of this post) and a picnic dinner experience by candlelight. From $1,255 per night for a one-bedroom tent in the fall. Rates vary by room choice and season. Image courtesy of The Resort at Paws Up. Guests at this Colorado “glampsite” can choose between mountain tents, with views of the 14,000-foot El Diente Peak in the Rocky Mountains, and river tents that look out over the west fork of the Dolores River. Private decks host lounge chairs overlooking the chosen view, while other amenities include king-size beds, gas stoves, two mountain bikes per tent, in-tent Wi-Fi and en suite bathrooms complete with six-foot-long bathtubs and towel warmers. As for cuisine, the camp chef primarily uses local organic foods, including fruit and vegetables from the camp’s farm and vineyard. For further relaxation, the camp also boasts a riverside spa and sauna, with private yoga classes available upon request. From $1,500 per night, with a two-night minimum-stay required. Image courtesy of Dunton River Camp. Just over three hours from Manhattan lies 125 acres of farmland and a set of luxury glamping tents with names like “The Tudor” and “The Butternut.” Each 320-square-foot tent has a wood-burning stove, five large windows, hardwood floors and ornate lanterns over the beds. A large fire pit and bathhouse are centerpieces of the glamping village and, nearby, guests have access to a pond, volleyball net and even a hammock park. The nearby town of Gilbertsville also offers apple picking, ice cream shops, antiquing and a local brewery, plus hot-air balloon tours. To top things off, the farm is home to a number of cats, a Chihuahua and — in a nod to British royalty — two turkeys named Kate and Pippa. Guests even have the opportunity to participate in special “goat yoga” sessions alongside the farm’s five goats — Thelma, Louise, Marianne, Ginger and Lyla. Packages and prices vary; contact Gilbertsville Farmhouse for more info. Image courtesy of Gilbertsville Farmhouse. 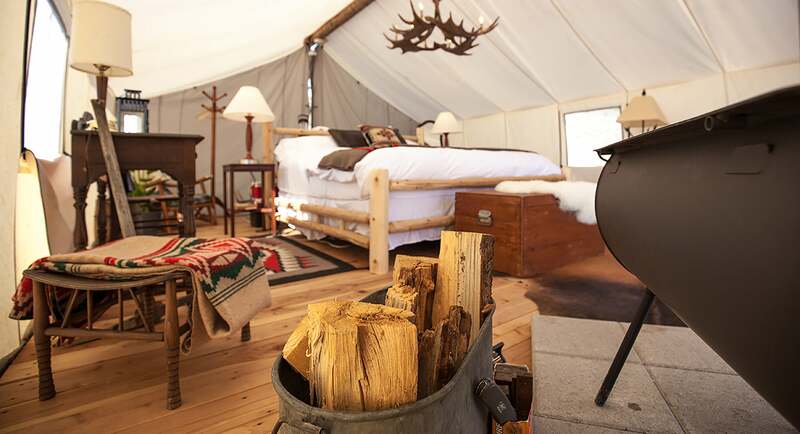 Think king-size wooden four-posters with down duvets, 1,500-thread-count linens and thick wool blankets, and you’ll get an idea of the luxury tents at the Collective Yellowstone, a Retreat at Moonlight Basin. And that’s just the beds alone. Each tent also boasts a chandelier, a private deck, filtered water, books and board games, coffee and tea service and a wood-burning stove with local firewood. As for the private bathrooms? They’re custom-designed and housed in canvas tepees — complete with rain-style hot showers and Turkish robes and towels. Foodwise, guests can expect complimentary morning breakfasts with daily sourced ingredients, in-tent snacks and evening s’mores. If you stay at the retreat during the summer months, expect in-season huckleberries to show up in everything from pancakes to ice cream. 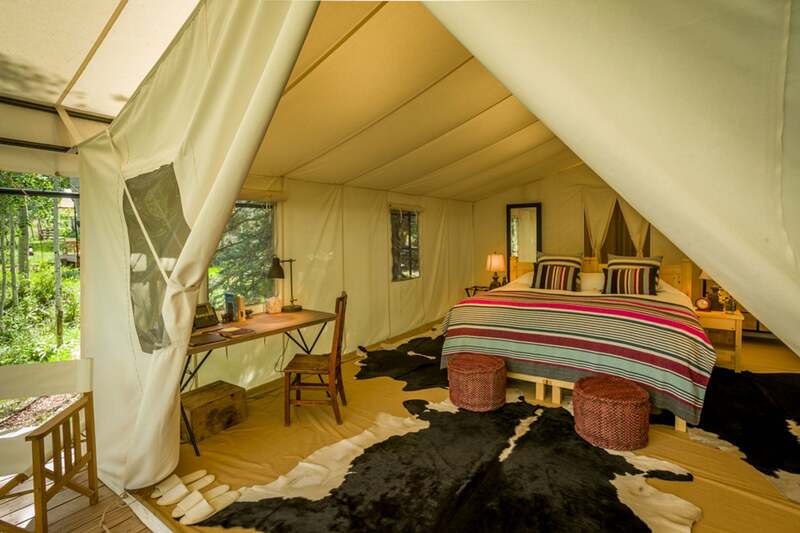 Luxury tents from $500–$700 per night. Image courtesy of Collective Yellowstone, a Retreat at Moonlight Basin. Sleeping bag? More like a king-size bed with goose-down pillows and treetop views. Hiker’s dry shampoo? More like scented milk baths in a century-old claw-foot bathtub with sustainable shampoo, Turkish cotton towels and spa bathrobes. Sinya is a safari tent for two overlooking Lone Man Creek in Texas — and the amenities here won’t disappoint new or experienced glampers, who can enjoy the likes of s’mores alongside free high-speed Wi-Fi. For adventure-minded guests, there are nearby opportunities to zip-line, swim in the creek or float in a swimming hole, and for those coming to relax, there’s a feather-cushioned sofa and a fully equipped kitchenette. 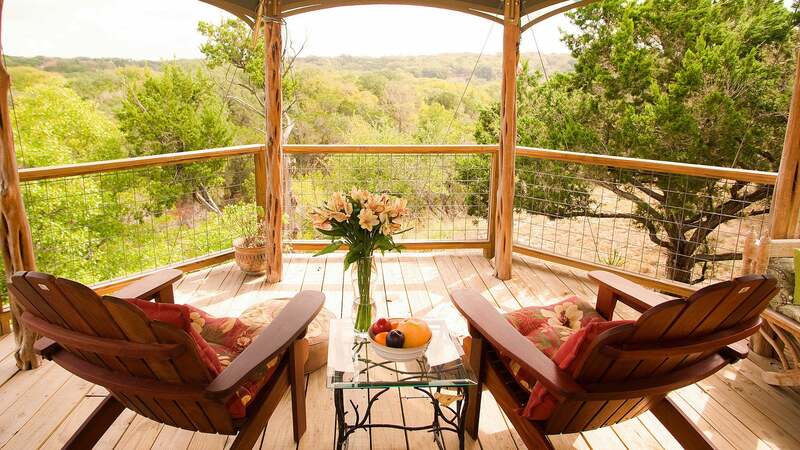 The tent’s private deck looks out above the treetops and holds a hammock, a hot tub and fresh flowers. From $335 per night. Image courtesy of Sinya on Lone Man Creek. 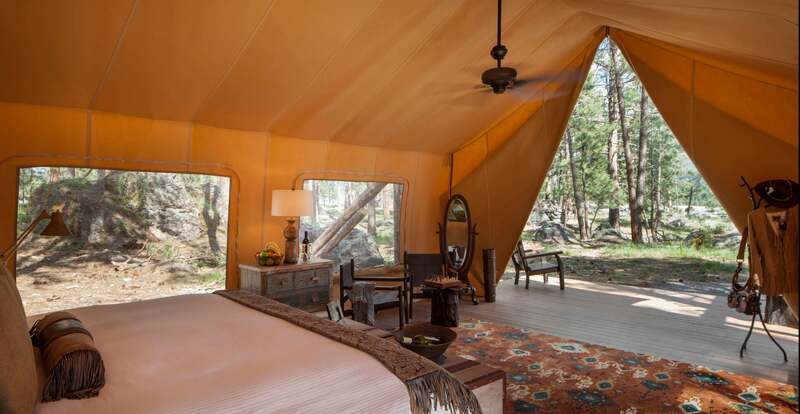 Where are your favorite places in the US to go glamping? Tell us about them, below. Featured image courtesy of The Resort at Paws Up.